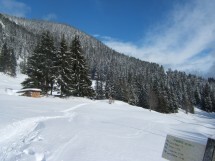 I organize a winter hike to the Montagne des Frêtes from Col des Glières (45 km from Geneva) on Sunday March 5th. Cross the Plateau to the east by the trail in the summer. Possibly, mark a coffee break at the Constance. In Outan-nord, view on the Auges massif and Mount Lachat, then climb to the Col de Spée. Descend to the chalets of Tinnaz, only steep passage can be slippery. Passage to the piedmont of Roche Parnal then to the col de l'Ebat. Stunning views of Champ Laitier and the Montagne des Frêtes on the left. The forest track is regularly lowered. At the Chalet du Plan, cross the plateau and climb to the Roncevaux pass on the Montagne des Frêtes, and go down towards the Maison du Plateau. A gradient of 815 m and a distance of 15 km. Walking time: about 5 hours.